My blended group of Leesville and Broughton friends gathered before the dance to take pictures in our dance attire. 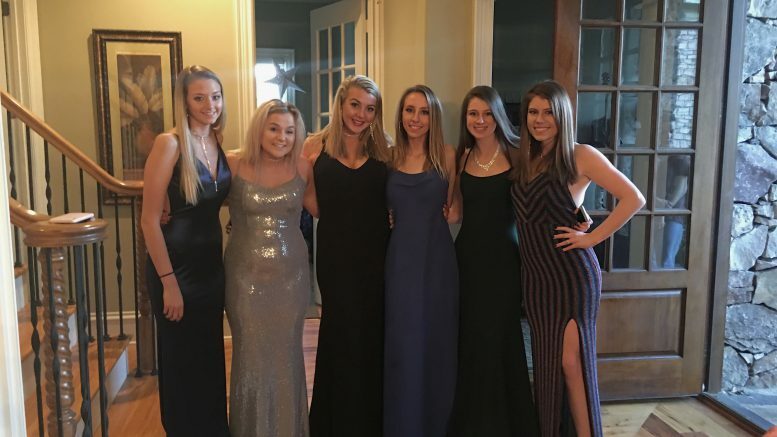 Broughton High School allows students from different high schools to attend the dance, as long as they are accompanied by a Broughton student. Photo courtesy of Olivia Fontaine. Queen of Hearts, otherwise known as QOH, is an annual dance held at Broughton High School. The dance dates back 78 years and will continue to be a loved tradition at the school. On February 2, 2019, I attended my second Queen of Hearts dance. For this dance, girls usually wear a floor length gown and guys wear a fitted tuxedo. I was accompanied by a group of close friends, most of who attend school at Broughton. The night is usually kicked off by group pictures, followed by a nice, filling dinner, and ended with the dance. Although some groups may opt to take their pictures at a scenic or distant location, our group chose to take our pictures at a group members’ house. This choice allowed us more time to get ready and try unlimited poses for our desired photos. Once the pictures taken pleased each group member, we maneuvered our dresses into a stretch limo and headed to Vivace, our chosen restaurant for the night. The food was delicious and well worth the expense. Vivace entertained us for one hour until each girl had enjoyed her meal and paid the bill. A text was sent, asking for the limo driver to retrieve us from the restaurant. When entering the school’s decorated gym, each attendee must provide a valid form of identification, a purchased dance ticket and a clean blow to pass a breathalyzer test. Broughton takes extra precautions to ensure that all dance attendees remain safe and protected while at the event. Every year, the school hires a fun and entertaining band to engage the dancers all night long. This year’s pick was a local band named Sleeping Booty. The band is known for their impressive covers of disco classics and funky costumes. The band’s presence kept the energy and excitement going all night. Once attendees began to depart and teachers started their goodbyes, we knew the night was coming to an end. For the last time of the night, our limo gathered us from the barren dance and took us home. Attending Broughton’s Queen of Hearts dance was an awesome experience I was lucky enough to have during my high school years. The event is always well planned and executed. I’m so grateful for being able to attend the event over the past two years. I will never forget the fun I had, the people I bonded with and the memories that I made at Queen of Hearts. Be the first to comment on "An outside look into Queen of Hearts"